Chris is a much sought-after composer, and has been commissioned to write many innovative orchestral concertos for a variety of artists, including celebrated guitarist Sharon Isbin, Canadian Brass, Time for Three, Nick Kendall, Muir String Quartet and other commissions from The Boston Pops, Baltimore Symphony, Colorado Music Festival in Boulder, St. Paul Chamber Orchestra, Indianapolis Symphony, Portland Symphony, Oakland East Bay Symphony, and many others. Chris’s highly acclaimed Concerto for Bass Trombone and Orchestra, has been played by many of the top bass trombonists in the world and was recorded with Chris as soloist with the London Symphony Orchestra. Fanfare Magazine wrote “Brubeck’s skill both as composer and soloist is extraordinary.” April 2009 saw the premiere of “Ansel Adams: America”, an exciting orchestral piece written by Chris and Dave Brubeck. It was commissioned by a consortium of eight orchestras and is accompanied by 100 of Ansel Adams’ majestic images projected above the orchestra. In 2013, “Ansel Adams: America” was nominated for a Grammy for Best Instrumental Composition, and has gone on to be performed by dozens of orchestras. Chris was a member of the Dave Brubeck Quartet for 16 years and was a frequent guest artist with the Quartet before and after that time period. He was featured on dozens of recordings with the DBQ and had the pleasure of playing all the great jazz festivals in the world. With the DBQ he often collaborated with symphony orchestras, and continues that tradition today as a soloist and with the Brubeck Brothers Quartet and Triple Play. Over the course of his career, Chris has performed with such diverse talents as Paul Desmond, BB King, Gerry Mulligan, Frederica von Stade, Stephane Grappelli, Willie Nelson, and Jamie Cullum. 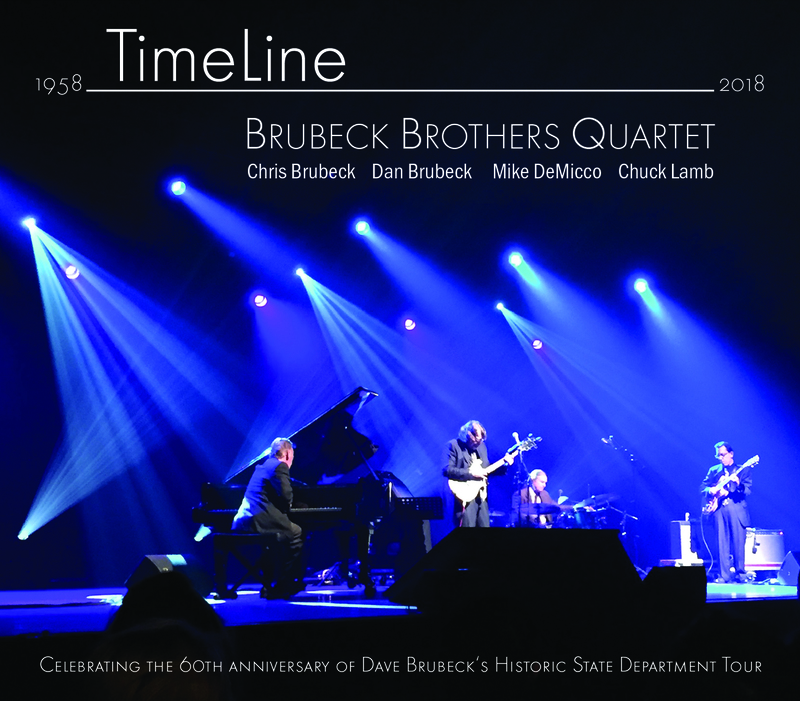 Dan continues to perform and record with his siblings — Chris Brubeck, a bassist, trombonist, and noted composer, in the Brubeck Brothers Quartet, and pianist/composer Darius Brubeck in Brubecks Play Brubeck. Dan also plays with the Vancouver-based Dan Brubeck Quartet (DBQ), featuring vocal powerhouse Adam Thomas. The DBQ recently released Celebrating the Music and Lyrics of Dave and Iola Brubeck, which showcases his father’s music and little-known lyrics of his mother. This recording was nominated for a coveted Juno Award in 2016. Chuck Lamb has been a member of the Brubeck Brothers Quartet since 2002 and is not only an exciting and emotive pianist in his own right, but also a prolific composer of jazz, fusion, classical and world music. As part of the Brubeck Brothers Quartet and with his own groups, Chuck has performed at numerous renowned venues around the world, including most of the major Jazz Festivals and in such international venues as Tchaikovsky Hall in Moscow with the Russian National Orchestra and with the Singapore Chinese Orchestra in Singapore. Chuck began his professional music career at the age of 10, playing drums and percussion in upstate New York. At 15, Chuck switched to piano and began composing his own music. Several years later, Chuck co-founded the exciting jazz fusion group, “Dry Jack,” which Rolling Stone History of Music cited as one of the premiere, cutting edge fusion bands of the electric jazz movement. Chuck has also written, arranged and performed a number of commissioned musical works for film, television, dance, fashion and theater, including works for Crestone Films; Electric City Couture (featuring Petia Kassarova, cellist with Grammy-winning Albany Symphony Orchestra); Nacre (Modern) Dance Company (“Seasons” with acclaimed songwriter/vocalist Ria Curley); Saratoga City Ballet (“The Nutcracker: Sweet & Swingin’” with Ria Curley) and more. Most recently, Chuck and his band have released a CD of his original “acoustic fusion” music, titled “North By Northeast.” The CD has been receiving airplay on major jazz stations and garnering new fans and rave reviews worldwide. Chuck has released a number of highly acclaimed CDs and has played with many internationally renowned artists, including Dave Brubeck, Bela Fleck, Larry Coryell, the Woody Herman Orchestra, Peter Frampton, David Benoit, Ernestine Anderson, Eddie Daniels, Dave Holland, “Cream” drummer Ginger Baker, Bennie Maupin (Herbie Hancock) and many others. In addition to being a professional touring musician and prolific composer, Chuck is also an accomplished and creative music educator. He has taught workshops and clinics across the United States, as well as in Japan, Singapore and Russia, where he taught a class in composition and improvisation to students from ages 6-70 and enjoyed the novel experience of teaching the entire class via a Russian translator. In the Fall of 2017, Chuck was honored to become an adjunct professor at Skidmore College, teaching jazz piano, ensembles and improvisation. Chuck is represented by JWP Agency.